A muscular Honda CB750 cafe from Belgium, a factory custom program from MV Agusta, a striking debut build from Motoism of Munich, and two new design concepts from Scrambler Ducati. Now where did we put our wallets? MV Agusta RVS #1 I’ve always viewed MV Agusta as the Lamborghini to Ducati’s Ferrari. Like the raging bulls, the MV design language leans heavily on testosterone and hypertrophy. And, as such, their products tend to be rare on the streets but maintain cult status. Topping their lineup, MV has just pulled the wraps off their angriest creation yet, the RVS #1. 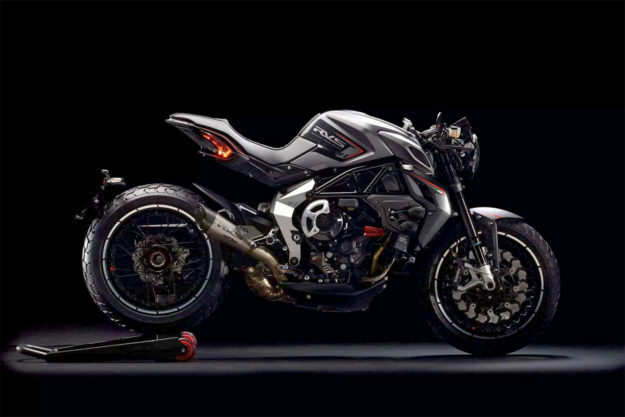 Powered by a 150 horsepower triple and tipping scales at a scant 350 pounds (160 kilos), RVS #1 is the first bike to roll out of the Cascina Costa marque’s ‘Reparto Veicoli Speciali’ program. The styling on this first example is familial, bearing a close resemblance to the Brutale 800, but the RVS series of bikes are all hand-built units tailored to the whims of the client. Helping keep the weight down, RVS #1 features titanium plates within its tank, a titanium exhaust system and aluminum panels are incorporated into the lateral structure of the steel trellis frame. Honda CB750 by McFly Customs Like most new builders, Antoine Hotermans tries to incorporate bits and pieces from his background into each project he undertakes. Working under the banner of McFly Customs, the Belgian builder has just pulled the wraps off his second project, which he says was inspired by racing, stunt riding, drift cars and…a Cessna. After chatting with Antoine I’m torn as to whether I want to ride Seven Fifty here or just hang with him to see what happens. 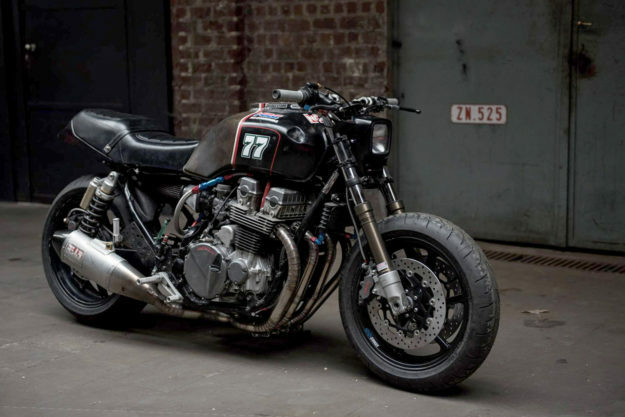 Shenanigans aside, those influences have led to a CB750 build with a serious performance focus. To help sniff out apexes, the entire front end has been swapped out in favor of an early CBR900RR unit, and the Fireblade’s rear wheel has been fitted too. The engine has some hotted up cams from a CBX750 and now breathes through an impressive handmade aluminum airbox. The four-into-one exhaust is a bespoke Workhorse Speedshop item, capped with a Yoshimura RS4 muffler. 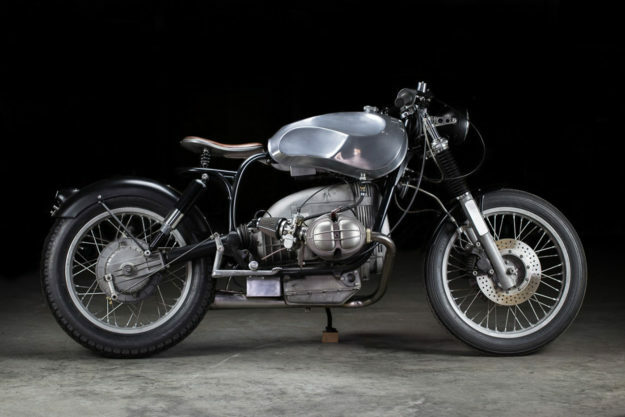 BMW R80 by Sette Nero I’m not taking anything away from the work that goes into crafting the perfectly shaped mold, but in the my book, sculpted metalwork will always trump fiberglass or intricately woven strands of carbon. Take a glance at the tank on this resurrected R80 and tell me you don’t feel the same. 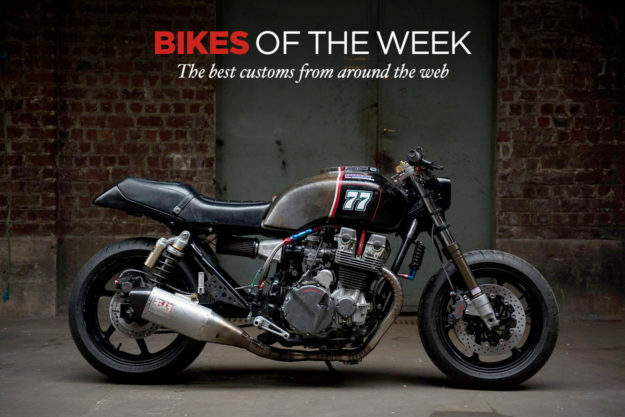 ‘Scintilla’ is the product of Sette Nero, a two-man build crew that’s been tinkering with bikes in their London-based shop for near fifteen years now. With that much time under their belt, you’d expect an encyclopedic compendium of builds, but this is just the third complete bike that Andrea Felice and Simon Black have completed. That’s because the building takes a back seat to day jobs in the furniture and sculpting industries, respectively. But just because it’s not their main bread and butter, don’t think for a minute they don’t sweat the details. Honda GL500 Silver Wing by Motoism Founded in 2015, Motoism is a motorcycle-and-apparel company from Munich that plans to specialize in limited runs of custom motorcycles. The Honda Silver Wing you see here is their first series, which is limited to 10 units, and pretty damned exquisite. It’s not often the Silver Wing finds much love in the moto community. It was kind of a dud on delivery, and sales stagnated before the plug was pulled. I dare say, had Honda gone the styling route of Motoism, the GL500’s fate would be entirely different. Much of that credit goes to the work on the subframe, which delivers a lighter look to the old Interstate tourer and complements the badassery set in motion by the fiberglass headlight unit. Scrambler Ducati Concepts Scrambler Ducati have added two new models to their fast-selling lineup for 2017. I was more than impressed by their scrambliest addition, the Desert Sled, and though none of us here have swung a leg over the Cafe Racer yet, friends that have tell us it’s a fine moto indeed. But that doesn’t mean either is perfect—especially from a styling perspective. 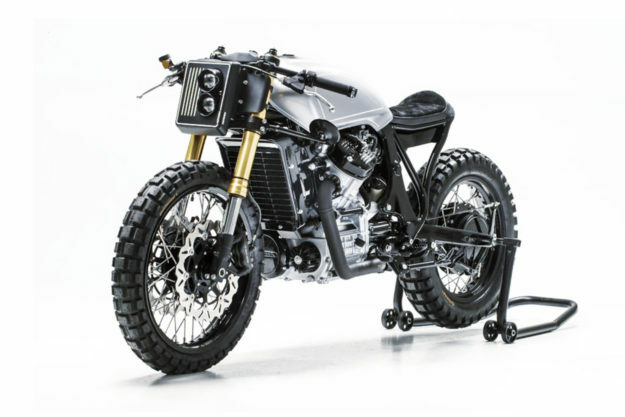 Case in point, the achingly gorgeous Scrambler Ducati Concepts you see here. 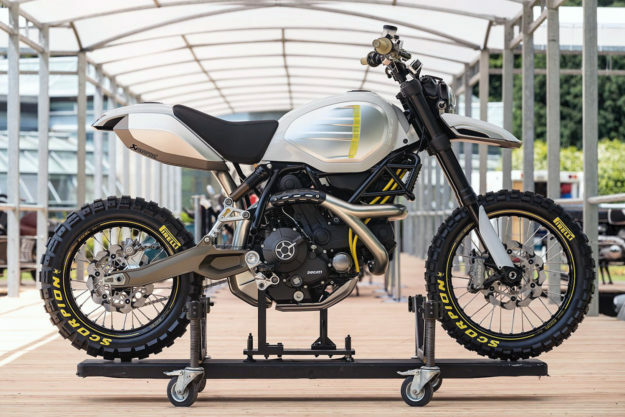 The Ducati Design Centre has certainly raised the bar of what we should expect when a Scrambler Ducati is hoisted on a bench. 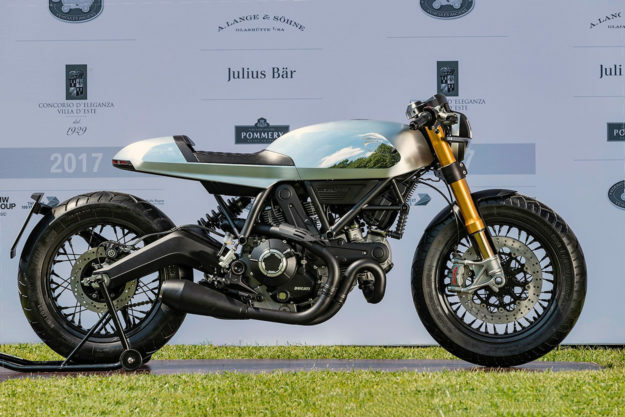 The Cafe Racer concept here not only scored a win at this year’s Concorso D’Eleganza Villa D’Este, but it also took home the first Villa Erba trophy by winning the popular vote. And we can see why. The bone line is spot on perfect. The cut off points define symmetry and the all-aluminum monocoque is the perfect mix of modern and classic.